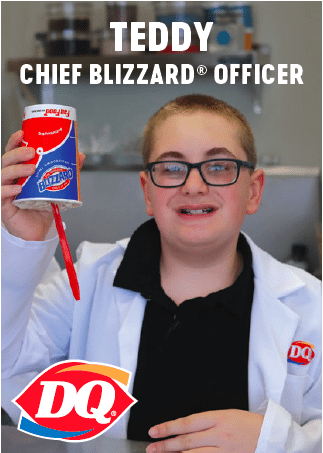 Dairy Queen announced Teddy Moore as Chief Blizzard Officer – Dairy Queen Corp.
That’s what 10-year-old Teddy Moore thinks of his honorary position as Dairy Queen‘s Chief Blizzard® Officer. Teddy is a pediatric patient at Cohen Children’s Medical Center in New York who is treated for hydrocephalus, a buildup of fluid in the brain. The condition results in problems with short-term memory, physical deficits and other neurological conditions. But despite having 36 surgeries since birth, Teddy’s appreciation for life is unmatched and he remains optimistic and full of charm. It’s for these reasons–and Teddy’s LOVE of Blizzards® at Dairy Queen–that lead to the announcement, which also commemorates Dairy Queen’s 13th annual celebration of Miracle Treat Day. During his day as Chief Blizzard® Officer, Teddy consulted with the brightest minds at International Dairy Queen headquarters to learn the secrets behind Blizzard® Treats and then created his own custom Blizzard flavor named the Buzzy Blizzard. Teddy’s role as Chief Blizzard® Officer allows him to help spread the word about how charitable funds raised by Dairy Queen’s fans and franchisees help kids just like him. Keep your eyes out for Teddy to tell you more about Miracle Treat Day on August 2 in the U.S. and August 9 in Canada. Next post: Kids first, then ice cream: #MiracleTreatDay is August 2!